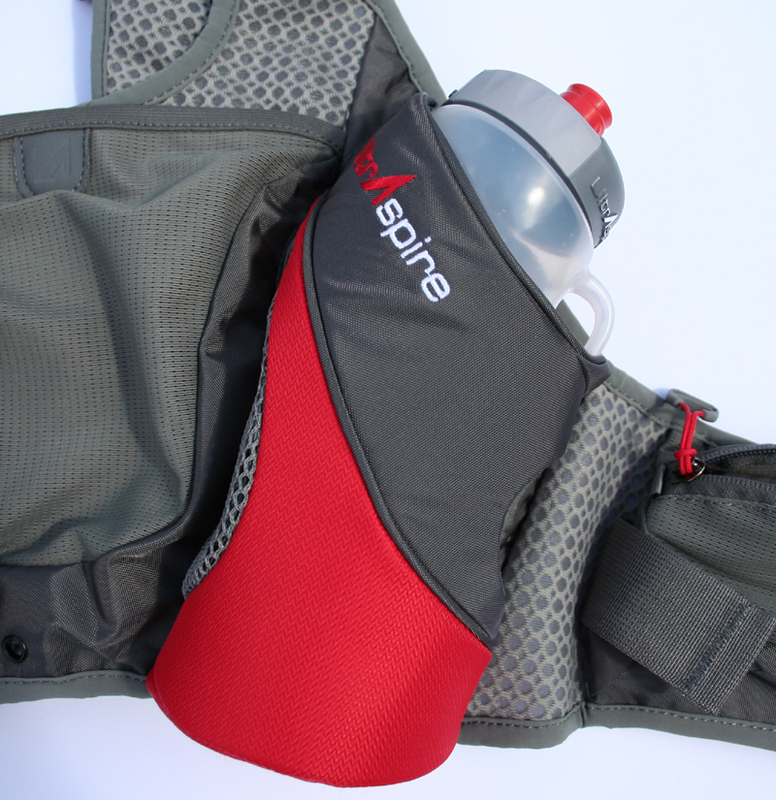 The UltrAspire Kinetic is designed as a performance bottle vest pack, being a light weight race vest style design with two rear bottle holders and minimal storage capacity through a handful of pockets. 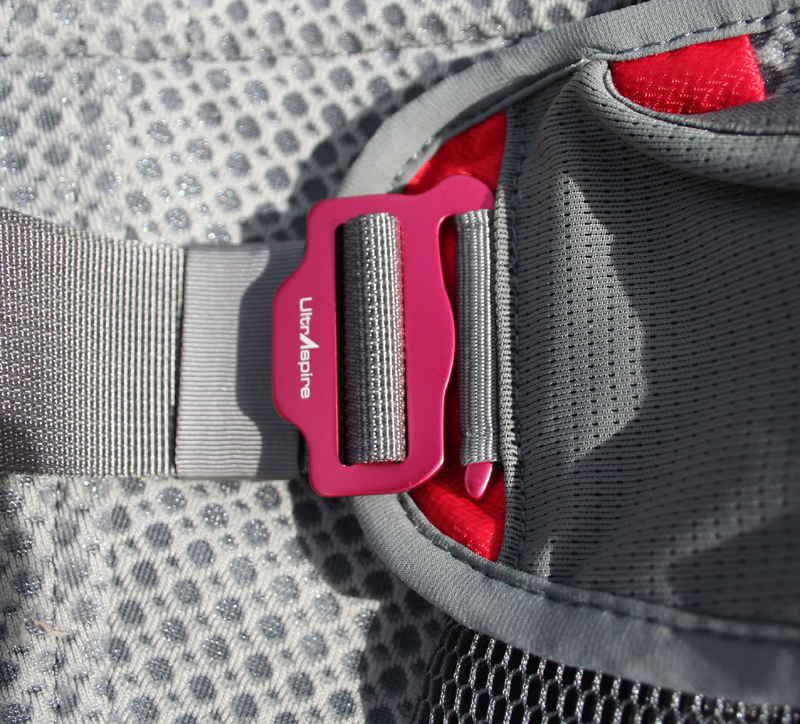 The harness design and position of pockets and bottle holders allows full freedom of movement whilst on a run. The harness design fits very comfortably over the body and is made from a breathable mesh type material. 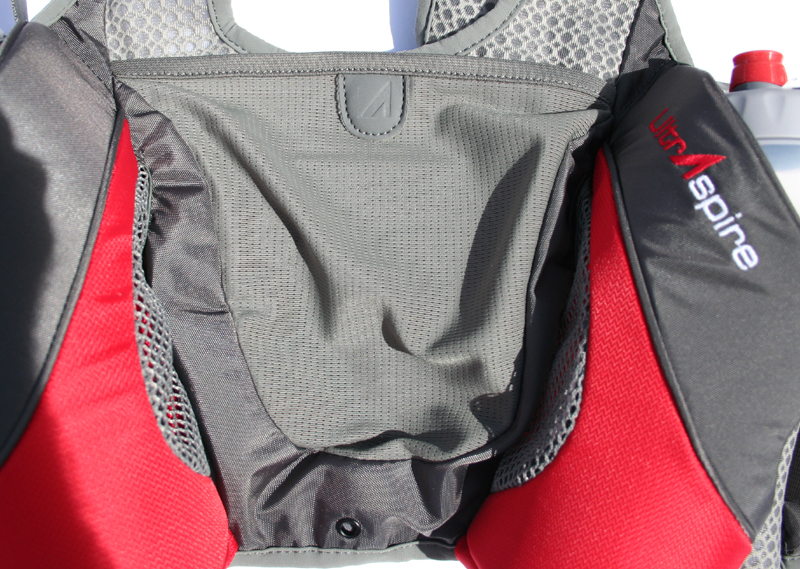 The top right hand side (as worn) of the harness features a small “Magnon Electrolyte Pocket” which snaps open and shut quickly through the use of a magnet and is designed to hold small items. 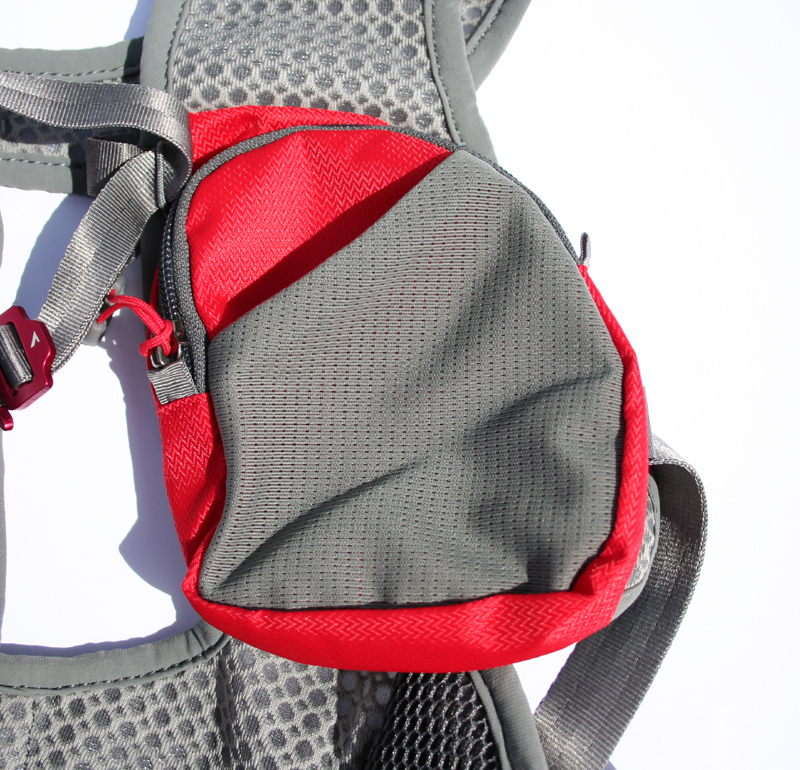 The lower right hand side of the harness features a small mesh pouch with a thick drawstring cord for the pouch, which can be used to carry a small bottle. 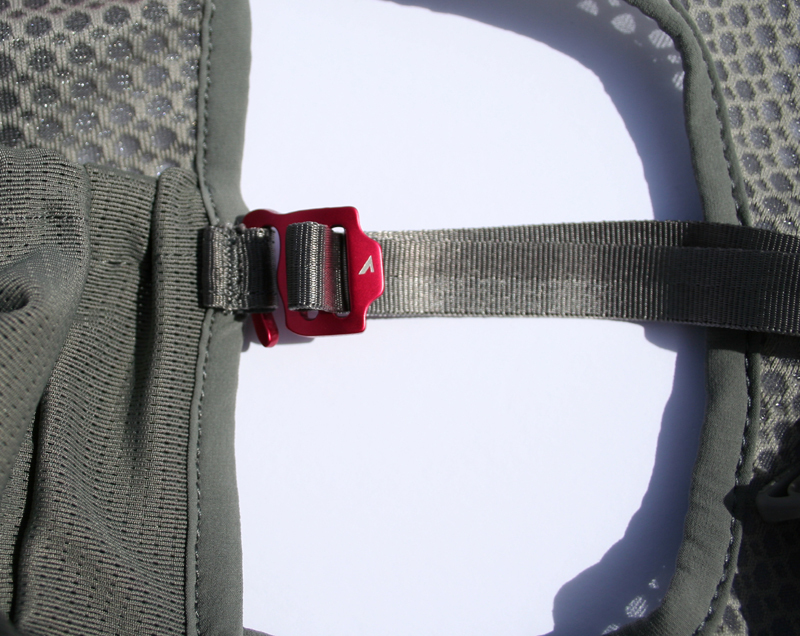 The top left hand side of the harness contains a small mesh pouch and elasticated band of material to carry a small item requiring easy access (such as a pair of shades). 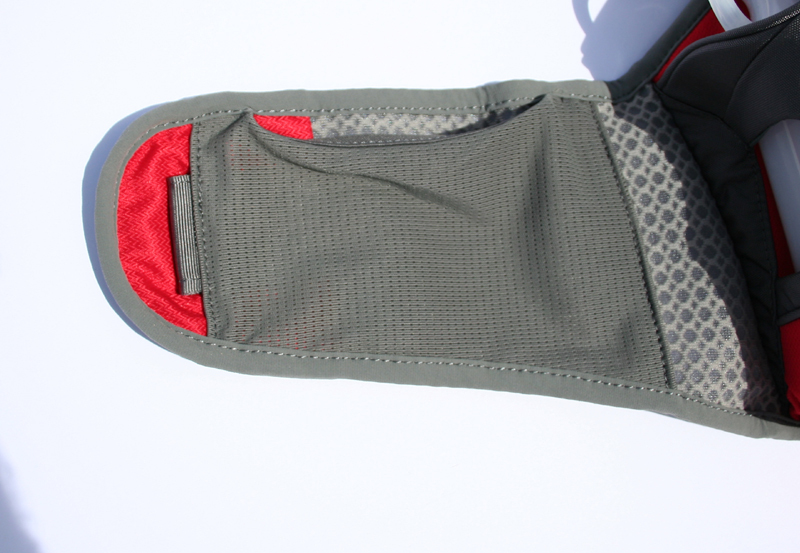 Below this sits a zipped pouch, which is large enough for a mobile phone or head torch. The zip is contains 3cm of cord and a plastic clip to make it easy to open the pouch when wearing gloves for example. On top of this sits an outer mesh pocket for small items or litter. The harness is secured by a small “speed hook”aluminiumclip across the sternum and a second larger “speed hook” clip across the waist. 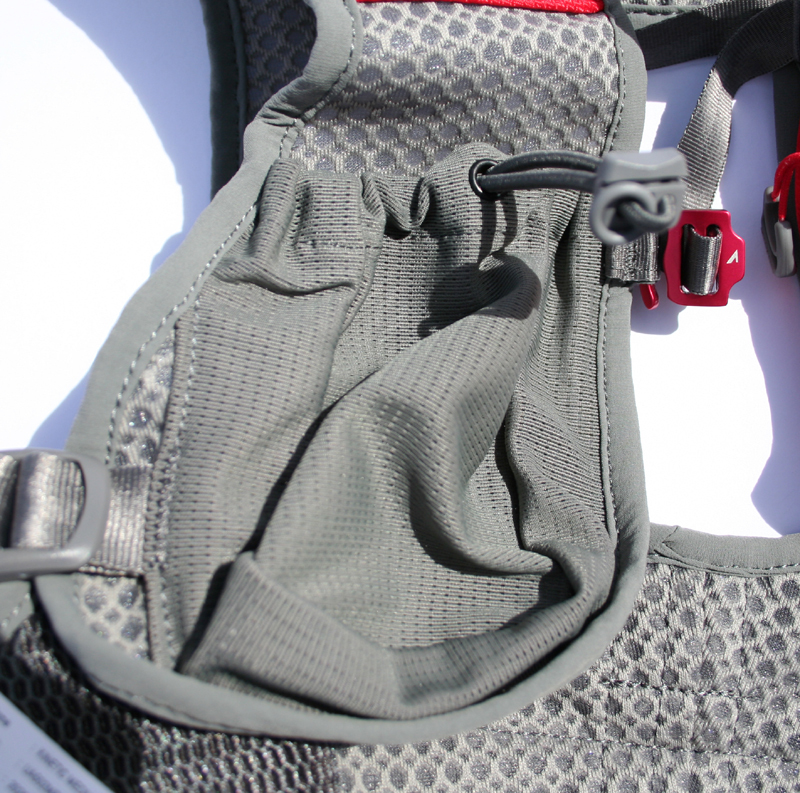 Both of these straps are adjustable allowing you to tighten or loosen the fit of the race vest. There are two additional pockets on the waist. The first is a zipped pocket on the right and the second is a mesh pocket which provide additional locations to store gels, mobile, sweets etc. The rear of the pack contains a quick stash mesh pocket which contains another magnet fastening system allowing small items to be removed and the remaining contents to be secured as the magnet snaps shut after use. At the rear of the pack are two foam insulated padded bottle holders positioned at an angle to allow you to reach these whilst on the run. The pack comes with two bottles with an angled head and finger hooks to allow easy removal whilst on the run. The angled head can be turned to face the inside if there is a concern over your elbows brushing the bottle head as you run although I did not experience this as an issue. The hard foam insulation allows the bottles to slide in easily. I also tried a Raidlight bottle and a Camelbak Podium Chill bottle both of which were slightly narrower than the UltrAspire bottle. All bottles fitted easily, although the narrower bottles were not as snug as the UltrAspire ones. The tall size of the bottle holder means none of these are likely to fall out in any case. The race vest can be further adjusted by a single strap under the right arm, which goes under the arms and around the body at the back. 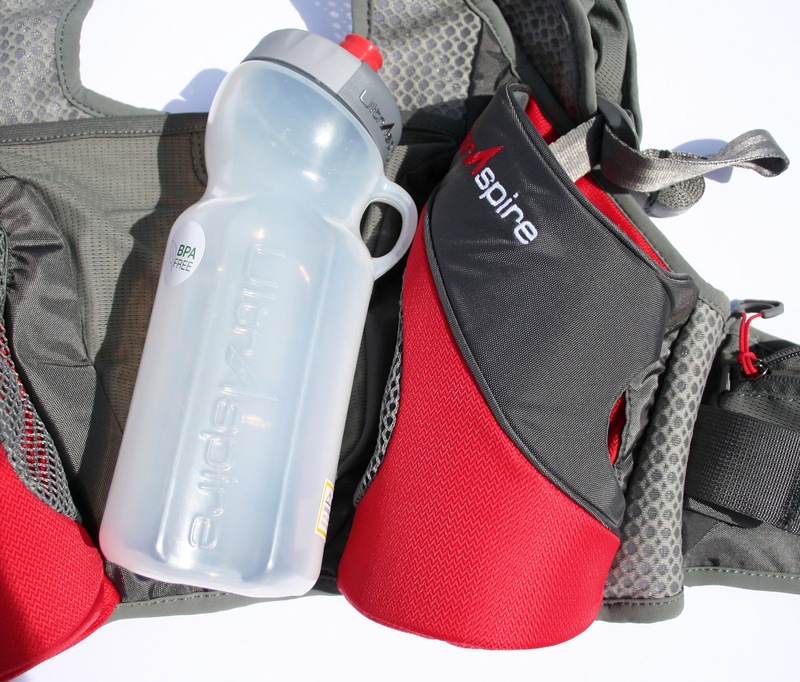 I really liked the UltrAspire Kinetic, having tried both hydration bladders and bottles during runs I am leaning towards the use of bottles due to the ease of refilling or swapping bottles at aid stations. The key strengths of the Kinetic for me were the lightweight and comfort of the vest, it’s good to feel you are “wearing” a race vest/pack as opposed to “carrying” a race vest/pack. I would consider this to be a good one day pack option where speed and minimal weight are primary considerations. 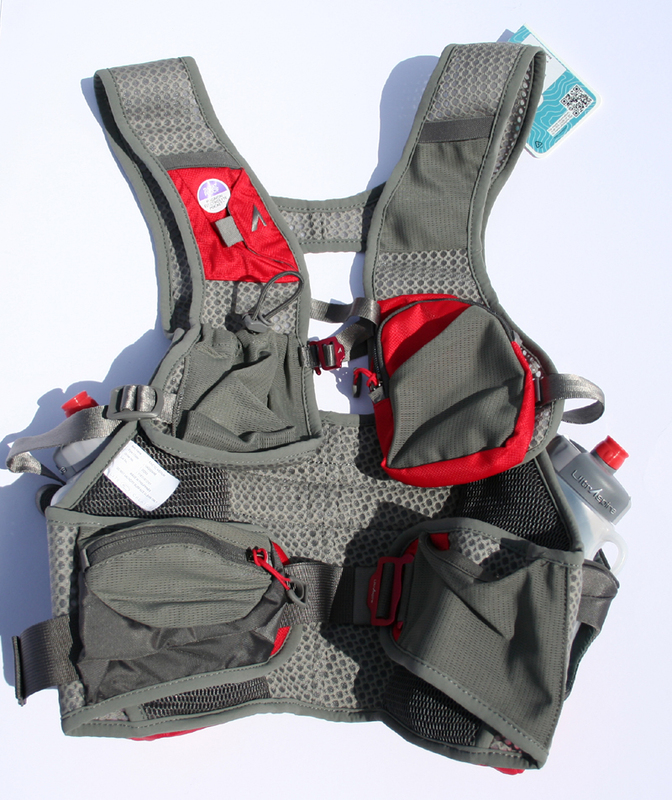 The Kinetic provides a good option for those who like to run Ultra’s where there are no minimal mandatory kit requirements and prefer the use of bottles to a hydration bladder system. 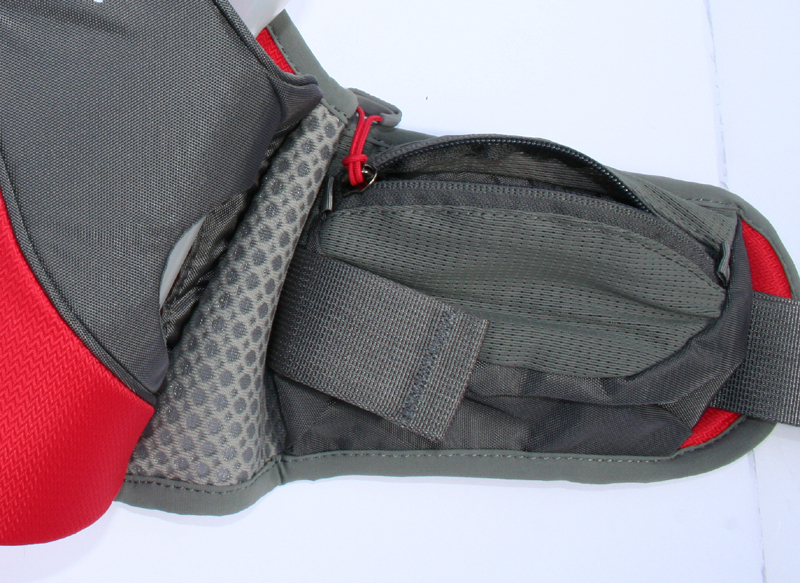 Despite no rear compartment, there are 6 pocket options on the front and a rear stash pocket all of which are easily accessible on the run allowing small items of kit like a mobile phone, head torch, gels, small items of food to be stored on the front and perhaps a rain jacket or mid-layer in the rear stash pocket. 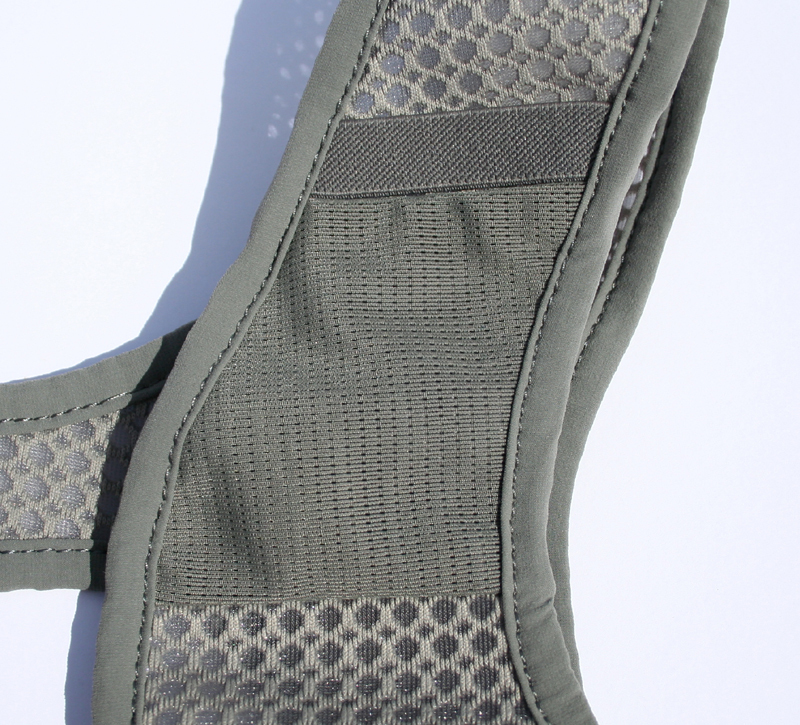 * Soft, fully breathable, lite weight mesh hip support featuring bio designed optimum efficiency. * Light weight adjustable Speed Hook™ attachment. * Low profiled dimensional zippered pouch on each side of waist piece that does not impede natural arm movement. * Quick stash right pocket is large enough to hold a spare bottle or other essentials and it uniformly compresses with cord. 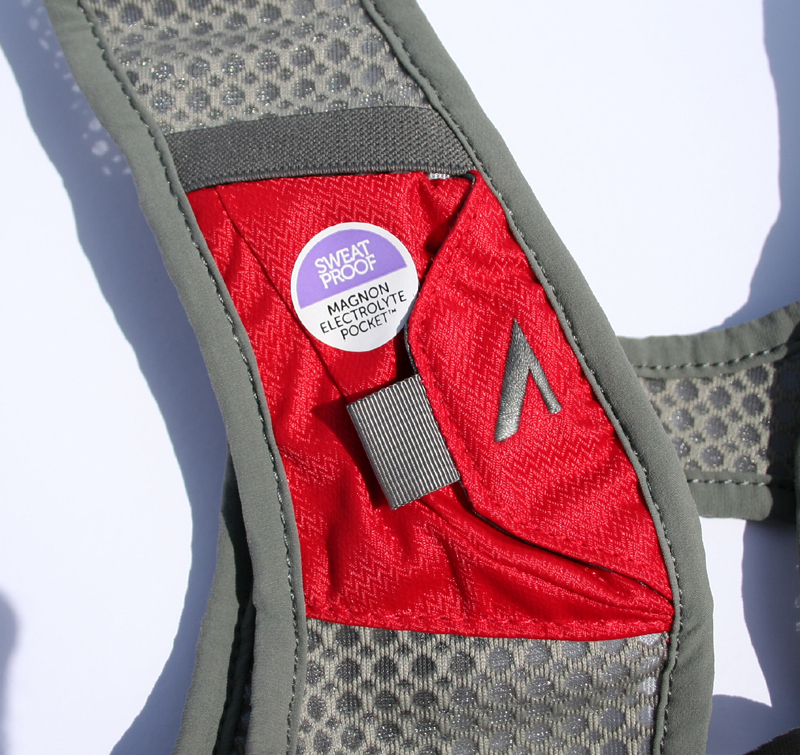 * Patent pending Magnon Electrolyte Pocket™ with easy worry free magnet closure. * Light weight zippers pulls easily grabbed even with gloves, cold or numb fingers. * Left mesh pocket over zippered inner pocket for securely stowing temperature and weather change accessories, energy foods and other necessary gear. 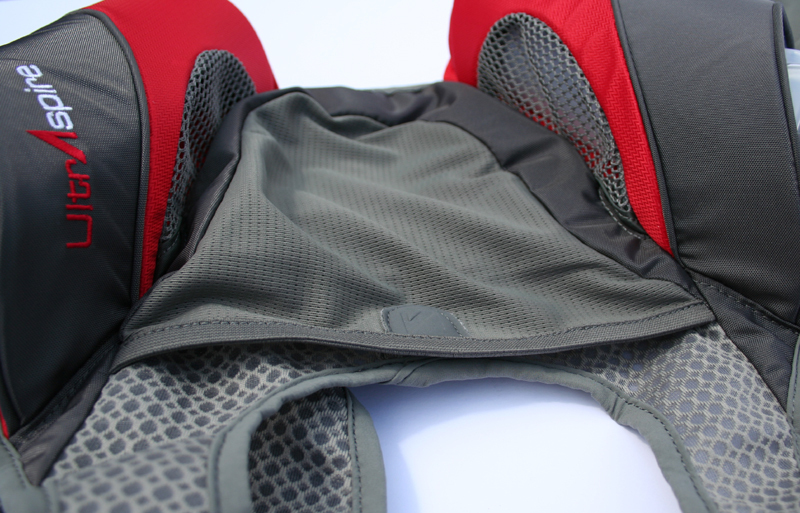 * Roomy upper back quick stash with magnetic closure designed like a bicycling jersey for quick and easy access even at full speed. * Ergo aligned and angled bottle holsters allow for ease of access; plus, patent pending* new feature aids return of bottle between usages, keeps bottle in proper position and aids stability. * Comes standard with two Human 26 oz finger loop bottles.